Indonesia has thousand of cultures that you can learn that came in many forms like dances, songs, arts, and also foods. The foods in the category will divide into some dishes or maybe some cakes. 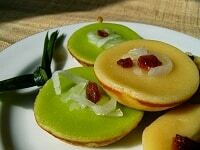 The cakes or the small meals, or the things we called as “Jajanan” in Indonesia is usually will served as dessert. However, beside that, many people like to eat them just to fulfill their stomach, for snack. They usually eat them in any time they want, day, night, or evening, as long as they can find them. The first on the list is Serabi. Serabis is a well known cake that many people made some creations from it. They add different toppings like mozarela, nut, sausage, and mayo. Actually it came from two different kinds of flavor, the sweet one or the salty one. Many people will pick the sweet ones because of its unique taste if they baked them inside a traditional stove. In these days, you can find many variants of Serabi, even he smaller ones called Serabi imut or Serabi Unyil or many other names. But don’t worry, the shape, the form, and the base composition of Serabi haven’t changed a bit. 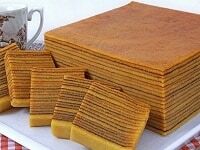 Beside the Original Serabi, there’s one kind of cake that has the same name but has many differents aspect from the original, called Serabi Solo. 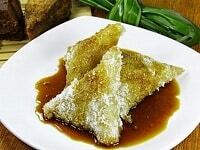 Solo area also has its unique Serabi of its own, with different from more like a pancake than Serabi, complete with this sweet taste that came from coconut and sugar. This Serabi is also well known in some areas in East Java. Some even start to add something delicious as a topping to make the taste more rich and wonderful. You can find Serabi Solo so easily in the local merchants in Solo city. The next one is a Lumpur Cake. Many people love the lumpur cake, because it’s somewhat sweet and also delicious for a small cake. The base compositions are potato, egg, and other ingredients. Usually the local merchants sold this in their stalls in the morning. So, best to grab it while the morning still come up because it will be gone in a sec, because many people love it. The raisins they added on top of it is a great touch of the cake, making it tastes really good. The sweet taste it has is actually many kids favorite in Indonesia, even though they seem to forget this traditional food now. Klepon is these green balls covered in coconut with sugar or caramel on the inside. So, when you bit them the caramel will melted out in your mouth. Plus the combination of rice flour and the coconuts will make it so heavenly. Well, in order to taste it, you can go to the market in your area. They usually packed the klepons into a plastic packaging, and added a toothpick as a tool to easily eat them. So by that, your hand will not be dirty. One package usually contain at least 3 or maybe 5 klepons that you can eat. They are really good. 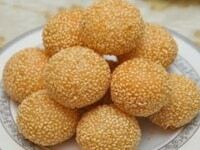 The next one is Onde-onde, which is one of the famous cakes in Indonesia. The Onde-onde made with wheat flour and they added this kind of topping inside. Usually they used green beans. On top of it, they added some sesame seeds, which is the only thing can differs Onde-onde from the others. Onde-onde will only cost you about Rp500,- which really cheap for a single cake. Two or three of it will easily fill your stomach, with its great amount of calories and carbo, made it a good stuff to eat in the morning. 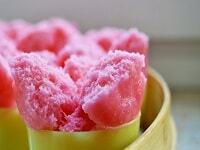 You can eat it while having a tea or coffee, and eat the klepon and combined it by sipping either of them. Semar is actually a well known character in the world of puppet (wayang) of Indonesia. But Semar Mendem, is pretty different thing. Many confuse this one with the other cake called Lemper or Lumpia. It’s actually a Lemper, but without a leaf as a cover. So, you can see the white wheat flour cover the inner “thing”. Well in the inside, you can taste the chicken which is already flavored with different spices. Usually they combined the eggs as its skin. But they used only the white only, and separate the yellow. Then the white of egg will combined with wheat flower to make it more thick as Semar Mendem skin. And finally they add the chicken into it, and there you have it, a good ol’ Semar Mendem. This is the famous snack or cake in our capital city of Indonesia, Jakarta City. 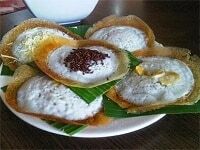 Usually you can find the merchant easily because they’ll shout the name of this cake “Kerak Telor”. Well, it’s basically an cooked egg, but added with the topping with this salty and somewhat sweet taste when eat them together. You can make it yourself if you want though. Just a proper frying pan, eggs, and then the toppings. The topping of the original Kerak Telor used many spices like red onions, white onions, grounded. And then the grounded ebi, and also some sugar and salt. Sounds rally simple, and easy to make, right? Of course it is. 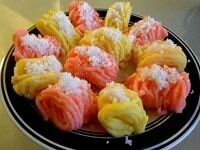 Then there’s Lupis on the 8th spot on the list of traditional cakes of Indonesia. Lupis is actually a sweet and a little sticky food that you can eat during the lazy evening. Too many sweet feelings can be found in this particular cake because they added really rich amount of sweetness that go from the sugar and coconut. After the Lupis done, they add some caramel or change it with liquid brown sugar on top of the Lupis. For the people who like the sweet stuff, Lupic can be the best option. And for the people opposite, well better to try just a little but of it because the sweetness is really strong with this one. This is the Indonesian cup cake. Basically the way of making them are also the same, but in Indonesia we do like to use rice flour more often. But the usage of small portion of wheat flour is always needed. In Indonesia, there’s so many variants of cup cake, different from colors and also taste. Some even call the cupcakes with different names. Like usual, there are so many kind of cupcakes you can find in the traditional market. Some bakery also sell the cupcake, but with less traditional aspects. But anyway, the cupcakes really good cakes for kids, especially the young ones. Even without having any tooth yet, the babies can eat the cupcakes with ease. Then, there’s Lapis. There are two kinds of Lapis, which is this one version is the original, and the other is Lapis Legit which has its own speciality. 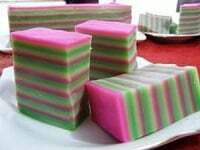 This Lapis used many proportions of pandan leaves, making it more good looking and smells really good. Lapis has many different colours, but with the same taste. Usually people eat it one by one per lapis (layer), not just eat it as a whole. With that secret technique, you can save more time to eat it, and can enjoy the Lapis more. The jelly-ish texture not came from the jelly. They don’t use any jelly in the process. That’s because of the combination of flours, between the rice and wheat. Making it more chewy. The other kind of Lapis. This lapis is only colored brown for some reasons. There are so many layers than the original lapis, making it more sticky and chewy. One layer in original lapis was made into three in lapis. So, if there’s only 3 or 5 layers in the original, then in Lapis Legit there will be 15 or more layers. The aroma you can feel from this Lapis Legit is wonderful. Making it requires a bit of intellegence and patience. It’s really confusing really, putting layer to layer and make one lapis legit. That’s why, Lapis Legit will cost you more than the price of the original Lapis, because it’s take so many things to make one. The difference between this and another one below is only the colour. The Getuk has just one or two colours, which is brown and pink. The taste of them are the same actually, because the basic components used also the same, the cassava. The Getuk is a traditional food that exists in many areas in the Central and East Java. They even sell them almost everyday, usually by the local merchants. For example, the local merchants in Malang city use the “Getuk Wagon” to sell the cakes everyday. They usually use the musics to attract more people that already knew the Getuk sellers. The other version of Getuk. The Getuk Lindri comes with so many colours like pink, white,green, and yellow. The taste is somehow different for each colour. Maybe they add some other flavor in them, or it’s just in our mind. 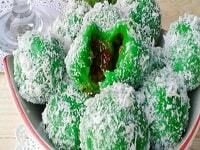 But nevertheless, the getuk lindri is also the best cakes you should try when you come to Indonesia. It’s a little bit hard to find them in the busy areas like Jakarta or Surabaya, but if you put some efforts into it, you can find them in any traditional market near you. You can get two until three Getuk Lindri with only small price. You can get one getuk for Rp500,- until Rp1.000,- rupiah. The next one is Lumpia. Usually you can find it in vegetables merchants, traditional markets, and also some merchants on the road. When you ride a train or bus for example, you can find some merchants selling them. The lumpia are always complete with a small amount of sauce and onion, the long and green one. They together are packaged into a plastic, ready to eat in one swallow (if you can). 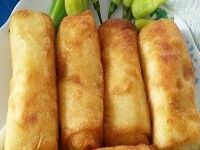 You can find the crispy texture on the inside, and there are many kind of vegetables inside Lumpia like carrots and sprouts. You can add the sauce to get the more spicy taste. And for the onion, some people love the feeling of eating onion and the Lumpia. They considered it as perfect. 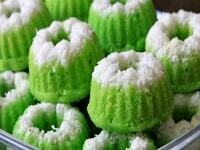 The famous and well known Putu. Putu is very easy to find, in fact, you don’t need to come outside your house. If you lucky, you’ll live in a neighborhood where there are so many merchants selling their snacks or foods. One of them, is Putu sellers. They use their wagon like usual, but with this special specification, the “Tuuuu” sound that came from the bamboos. When you hear that special charming sound of Putu, you’ll get your money and will definitely buy them if you want. The bamboos are used to cook the Putus. Well, about the Putu, it’s really a sweet one, with the brown sugar inside. Really delicious if you ask me. 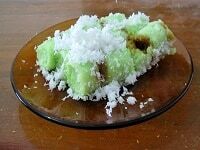 Next one on the list of traditional cakes of Indonesia, there’s the other version of Putu which is Putu Ayu. 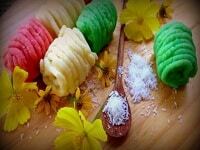 Came with different form, Putu Ayu became a favorite of people. The texture of both Putus are really different. 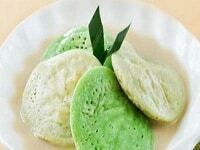 With Putu, you can easily break it with only press the body of it. But with Putu Ayu, it won’t be easy to break it, because it’s actually really firm. Taking a form of a flower, the Putu Ayu reach its fame in a such short time. Usually the ones who liked them are the mothers and the girls. The beautiful form of flower and also the smell of pandan leaves are beautiful things. Sushi is one of the best things in Asia. But in Indonesia, we want to introduce you with its special sushi called Lemper. 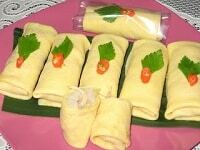 Covered with banana leave, a Lemper usually has the chicken meat inside, with rich flavored one. Usually we eat it by grabbing the banana leave and then push the Lemper inside from the bottom. And then, you can eat it, without making your hands dirty. 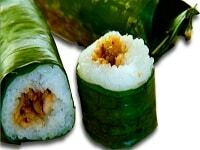 It has a really delicious taste, and Lemper will be there in every food package of traditional activities in Indonesia. Now there you have it, the traditional cake of Indonesia. Well, all of them are really delicious, and some of them even fit your tongue. So, don’t need to worry about budget because they’re way more cheaper than you imagine. With some money in your wallet, go to the nearest traditional market and hunt them! Make sure you’ll be prepared with thousand tastes you’ll get from them.